Smoky ham and hearty potatoes in a rich, creamy broth. 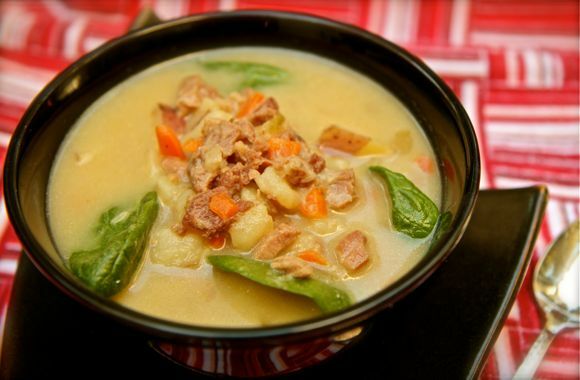 This hearty and flavorful Country Style Ham and Potato Soup is perfect for taking the chill off on a cold, winter day. What makes it Country Style? It’s chunky y’all! Notes: Makes about 8 cups soup; four entree servings. Serve over shredded cabbage, spinach or other greens for added color and nutrition. If available, the ham bone enhances the flavor of the soup tremendously. Allow ham bone to simmer in soup; discard before serving. 1) Cut or shred ham into bite-sized pieces. 2) Wash and partially peel potatoes. Cut into small, uniform cubes. 3) Heat two teaspoons oil in a large pot over medium heat. 4) Add diced carrot, celery and onion. Cook and stir just until tender, about ten minutes. 5) Add ham pieces and Worcestershire Sauce. Cook and stir until ham starts to brown. 6) Pour in one cup of broth and scrape any caramelized bits on the bottom of the pan. 7) Add minced garlic and cook a few minutes more. 8) Add diced potatoes and turn the heat up to high. 9) Add the remainder of the broth and bring to a gentle boil. 10) Cover and simmer over medium-low heat until potatoes are soft, about 20 minutes. 11) Stir in sour cream and dissolve. Taste and adjust seasoning. Cook 10 minutes more. 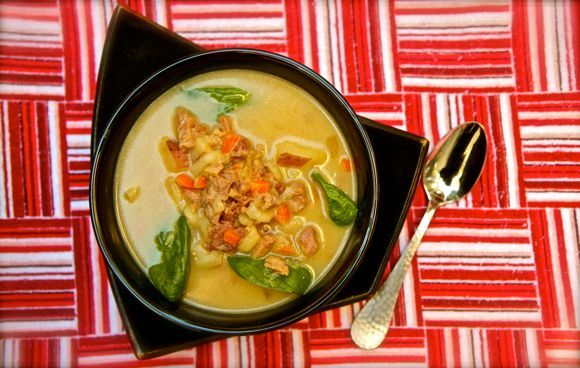 Country Style Ham & Potato Soup Recipe developed by Sara O’Donnell for Farmer John on behalf of Golin Harris. Average Betty was compensated and supplied one Bone-in Farmer John Ham for this promotion. Farmer John products are sold in California, Nevada, Arizona and Hawaii. I so want this soup for lunch today! YUM! My husband said, please make me that soup!!!! Looks wonderful.